My house is 12 years old and it looks that the exterior of my chimney needs to be repainted. Can you please help me select the correct paint for the job? I attached the picture of my chimney. I would recommend a thorough power washing and an inspection for termites or rot prior painting. 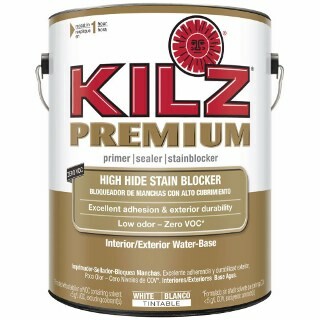 Start by priming the chimney with a good quality primer such as Kilz Premium Primer and Sealer. This product will give you a solid base to apply your top coat to. Its is water based so clean up will be easy. Use Behr Premium Plus Exterior for your top coat. This is a high quality product recently tested by consumer reports and given a very high rating. I know now you are going to ask about all in one paints. Separate primer and paint finishes are still longer lasting then all in one single coat finishes. In fact most paint manufacturers recommend two coats when using an all in one paint. So the same amount of work and a better longer lasting finish will be achieved with separate primer and paint coats. To ensure the paint you use will effectively coat over the existing chimney, you'll need to first clean and prepare it. To do that, you can opt for pressure washing or scrubbing the chimney to make sure the new paint will cover over it. Next, if the surface is in good shape you can opt for using an exterior grade flat or satin finish paint to cover over it without the benefit of primer. 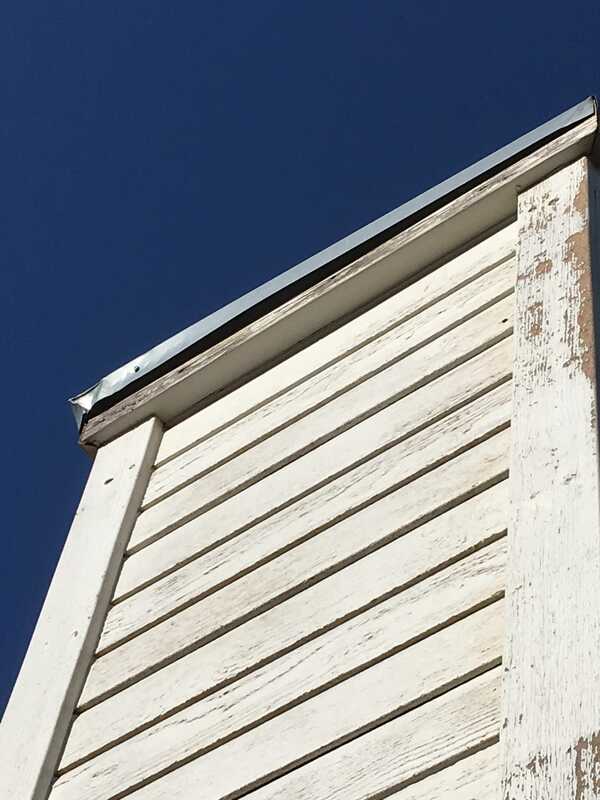 However, if this is stained (hard to say judging by the pic), you'll need to apply an oil-based exterior grade primer first to ensure the final coat of exterior grade paint can bond to it successfully. All of these products are sold at your local Home Depot store, including the tools to use to apply it onto the chimney. Thank you very much for your responses to my question. I'm posting another picture to give you a better idea of what I'm dealing with. I was merely planning to paint over the old paint but based on your responses I see that will not be sufficient to do the job right. 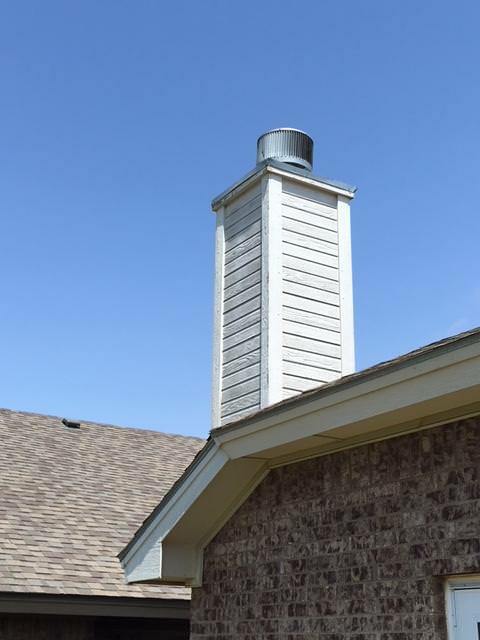 What pressure do you recommend to power wash the chimney? Also, can I use a roller to apply primer and paint? With painting projects there are often many many ways to accomplish the prep needed. I can see how pressure washing would work well if you were painting the whole house. It's the easy way to cover a lot of area and so waiting for the siding to dry out is not so bad. Up on a roof is a different thing to me. The project is fairly small. In simple terms all you need to do is get the blistering and flaking old paint off the wood before you prime and caulk it. I may choose to get a good carbide paint scraper and scrape away most of the paint. Or if I felt especially lazy I would get out my palm sander with 80 grit paper and just go over it all. It's not very big so it won't take long. If you use a good primer you won't really have to wash it after sanding, though I would take a scrub brush and a bucket of clean water and just scrub it from the top down to get dust/flakes off the wood. Let it dry and you can prime. Any good primer will do the job. 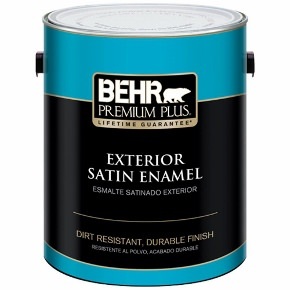 The Kilz mentioned above is a fine choice, as is Behr 436 exterior primer. I particularly like BullsEye 1-2-3 as it sticks well to almost everything. Just don't cheap out on it. You get what you pay for. An oil based primer might just last a little longer than latex, but you then have to deal with mineral spirits instead of water for clean-up. If you remove most of the old paint then oil primer will penetrate the wood better than latex will. Once primed you can either caulk with paintable caulk and then paint, or paint now and use a better caulk of pure silicone later. Pure silicone caulk is generally non-paintable. With a white chimney you get your choice. You will want to make sure that the vertical cracks are filled though. Roller or brush? You can use a roller, but you will need a small brush anyway for drips and to get into all those crevices. That's how I would do it: a 4" roller and a 1 1/2" angle brush. Thank you so much for your advice. I prefer your method to pressure washing. I didn't even think that I needed to caulk anything but now I will definitely use caulk to fill those vertical cracks. So, do I need not worry about filling horizontal cracks? One more question. Please take a look at the attached picture. There is a metal crown on top of my chimney and there are gaps between that crown and the wood. Can I also fill those gaps with pure silicone or some other type of caulk. You appear to have a German Shiplap siding in a rough cedar. There is no caulking in the corners because the corner boards lap over the siding. Were it mine, I would go over the siding with a sharp pull scraper and wire brush to remove the flaking paint. If no mildew or algae is present, the scraping and wire brushing should be sufficient. As to paint: I would not use a paint at all, but rather two coats of a solid hide acrylic stain. Behr Solid Hide stains can be mixed to any of the Behr palette of colors. The stain is self priming, with the first coat of Stain acting as the primer. 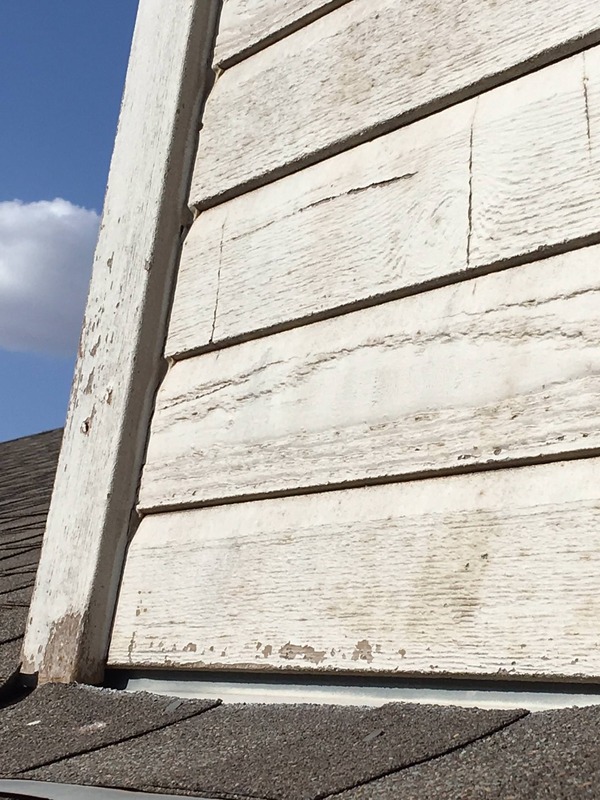 Your siding appears to show signs of tannin leeching stains. These are the yellowish/reddish stains. However, when using a water based stain killing stain, it is a good idea to do the second coat on the next day, as its stain killing ability needs time to set the stain. If you simply re-coat an hour later, the water soluble tannins will continue to leech to the surface and cause stains.